Sorry to read about your accident (just). I broke my pelvis as a teenager playing hockey and spent 8 weeks immobilised. Didn't have the Internet in those days so no nice nursy pics to help me along . I guess if you're going to throw yourself at a mountain the best time to do it is 'out of biking' season. Get well soon and best wishes. Andy. In your delicate condition, that's probably a good idea. We prayed for you this morning at Men's Prayer Breakfast. Right at 8 eastern time. Did you feel any relief around then? To tell you the truth, I did wake up around five am, pacific time, read the bible awhile and snoozing on it, figured that I could possibly sleep a little more, decided on a bold move and turned on my stomach. My a$$ was so happy taking a load off, that it just about woke me up with it's screams of joy! Sorry to hear about your "incident", heal quickly and well. Not that this is much consolation, but both the U.S. National Ski Patrol and Canadian Ski Patrols emphasized pelvic injuries in our outdoor emergency refreshers this year. So at least the patrollers were up to date in care processes for getting you off the mountain. Pictures of Nancy Green brought back lots of memories from my days as a tech rep for Rossignol, Dynastar and Authier skis. Hey man. Hope you get better quickly, and don't go all Rush Limbaugh on us, and are able to ride your machine once the rivers and the frozen tundra thaws. Pretty humorous. Don't laugh too hard. Question: How fast will you permit the toboggan to go down with an injured skier in it? As for Nancy Greene, I would love to meet her. Gotta watch my staples down there... don't wanna bust a gut. You sure do know how to take a loooong vacation with lots of people serving you. I'll add another nurse to help care for you... since Fran did such a great job. Can't someone censor such a disgraceful reply? Traumatic pelvic injury can have a lot damaged along with possible several internal bleeding. Pelvic sling, load and go. Reduces the time and less chance of dropping someone. For us less than 250 meters vertical urban area, the EMS is less than 5 minutes away. They usually are waiting for us, it's quick to pass on to advanced care. In the mountains, we just headed to the copter landing zone. Patrolers still woudda needed SaR's rope rescue team for where I was. In Search and Rescue, the bird is the way to go. I think Muddy1 muddled into muddy waters... Heilman territory if you ask me! Hey Louis, how you holding up? Been sitting at home, good thing I have this site to keep me busy. Will watch last night's championship game today as guests showed up for supper last night just as the game was about to start. Yeah, they also brought the meal! But best of all, Lucie has flown in for eight days and might prolong her stay. The staples came out on Sunday. I finally had my first shower in two weeks! Very sorry to hear about your mishap Louis. Take it easy and heal well. At least this threat had some real color to it! Glad to hear that yoou're on the mend, Louis. "I Screwed Up! Monday I was coaching (lay coach) the high school boys varsity soccer team. Wet, muddy slippery field. I slipped, went over the top of my ankle, landed with all my weight awkwardly on my knee that was bent crookedly under me. The result was not a break, but the most serious degree of "high ankle" sprain you could get. I am not as bad off as you, Louis, but I am in a boot for 6-8 weeks. Crutches for the first two." Hopefully you'll heal good & fast and be able to train for the half marathon that you intended to participate in. All the best bud, my thoughts are with you. 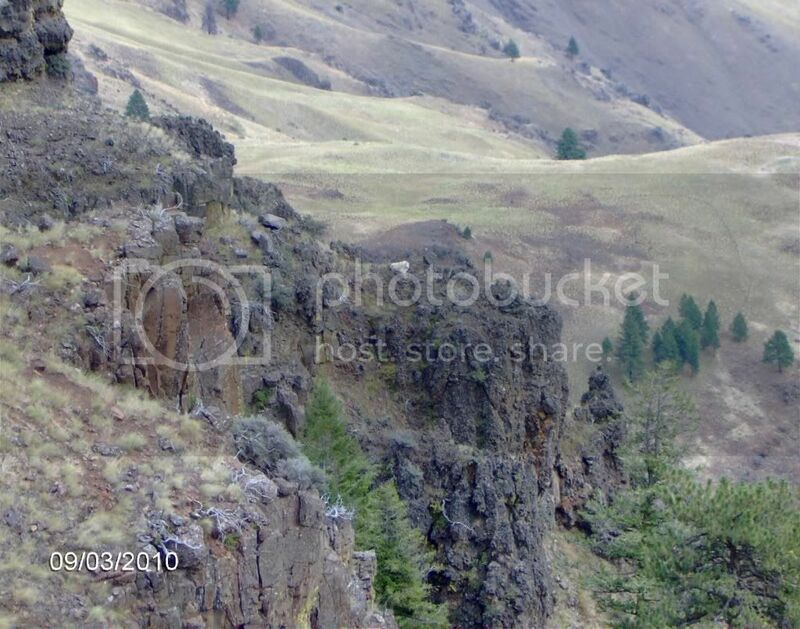 Now you have time to contemplate Hells Canyon and N.E. Oregon. Great place to hold a rally! Hell Yeah! Could be snow by then. Probably sometime in August, I'm thinkin'. Bow hunting is September.Chief Joseph days Rodeo is July 26-31.Half-way has the best 6 dollar showers at the motel and Imnaha use to have the rattlesnake round up and bear feed but I think it was discontinued. Waite a minute.Maybe I'll bow hunt and ride for two weeeks.Ok, September is fine with me. That should get his blood flowing, and something bouncing! Hey Al, when I went last Sept. with Craig we only got great weather and NO LEOs ! So I cut down on the painkillers to alleviate the poison I'm feeding my stomach. I'm finding out that many positions now involve some level of pain. What I took for granted before was in fact masked by the meds. So it's prolly a good thing. Lâche pas son père , ça peut juste aller en s'améliorant ! There is a bit of Quebec slang there so I am not surprised computer translation would not do a proper job. Roughly translated, "I don't work, so I'll be there next week with hookers and scotch!" COUSI.... you are BAD !! Mahteen is into bourbon... But I would appreciate the scotch! Still sitting around watching the bluebird days we've had in the last week. Had it been a bone break, it would already have started to mend. Being the open book type of break, it's all cartilage and ligaments that were torn apart. For that to mend properly, it can't sustain another tear. The bench where the metal plate is screwed into can not be subsequently reworked on. Not much surface to work with. It's like a one time fix. Not much of a second chance. I'll post the picture of the X-ray when I get my hands on it. Hey , we will be able to compare pics by then . Is that pic upside down? Being the open book type of break, it's all cartilage and ligaments that were torn apart. For that to mend properly, it can't sustain another tear. The bench where the metal plate is screwed into can not be subsequently reworked on. Not much surface to work with. It's like a one time fix. Not much of a second chance. Sorry for this mishap, knowing you are an extraordinary skier Louis. Myself and Luce did not know about it. I see that you had an "open book" type of injury on your pelvis. I had te same type of injury on september 28 2007. I then crashed my K1200GT 06 on route 75, 10 miles north of Helen GA at Deal's Gap Rallie. I suffered a 30 mm (1,18 inch) opening at the junction of the 2 pelvic bones. But, I had no bone fracture. The meds let me like this at the hospital in Gainesville GA. Got back home by plane on crutches and it was reduced to 20 mm (3/4 inch) 4 days later. Then progressively less. I recovered well in about 4 months and was able to resume running in March 2008, wich is I still do. I wish you the best Louis. Martin's knee surgery reminded me of my accident. 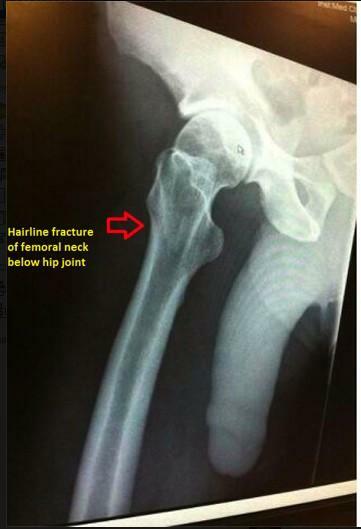 I had a slight fracture of the femoral head. Hey Martin who was that standing behind you??? The difference between yours and mine is that my book was open 7 inches + ! The orthopod told me that had it been an inch or so, no surgery would have been needed. Time would have done it's job. The collateral damage sustained was extensive as many muscles were torn and the digestive system, instead of being a nice compact affair, was all over the place. He said that the whole thing looked like a dog's breakfast! It wasn't nothing! Au contraire! I now know how much time it takes and you've been there. Basically the same process except mine is somewhat a little more complicated because of the metal plate and the screws and that there is no going back for a second chance. That's all! Went to see the orthopod yesterday. He likes what he saw. So keep acting like a paranoid and stay off the right foot. He told me that I could NOT fall down, to keep the crutches with me at all times, keeps the others from running in to me... So no crowds, etc.. He said that I should put my foot on a scale and see what 15 lbs max felt like. That's the maximum pressure allowed on my right leg for the next month! On the plus side, he gave me permission to drive my car! Joe must be busy, here is what I found when googling "Louis's root canal"